Meet Boston Bruins forward Ryan Donato! The Worcester Railers host the Brampton Beast on a 2-3-4 Friday on Dec 7 at 7pm! 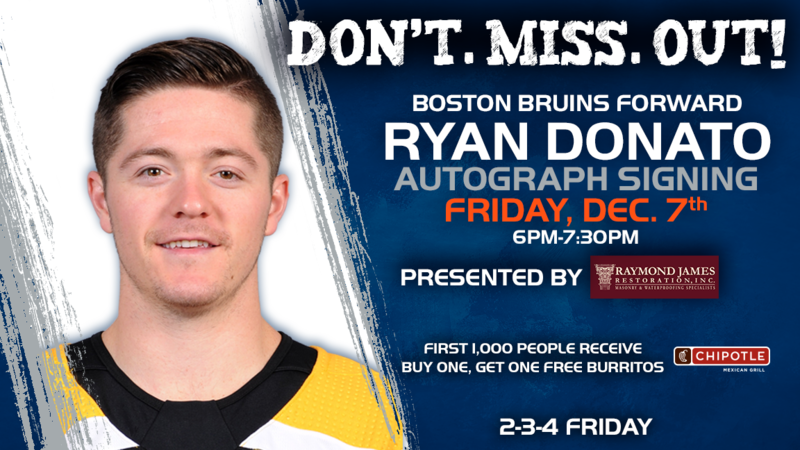 Score Boston Bruins forward Ryan Donato’s autograph from 6-7:30pm presented by Raymond James Restoration! The first 1,000 fans receive a BOGO burrito offer from Chipotle! It’s another 2-3-4 Friday as fans can enjoy $2 popcorn, $3 soda, and $4 bud lights in the Bud Light Lounge! Tickets are as low as $15! Call 508-365-1750 to score your tickets today! https://railershc.com/wp-content/uploads/2018/11/12-7-redo.png 648 1152 admin /_media/logo082018.png admin2018-11-29 15:54:592018-11-29 15:54:59Meet Boston Bruins forward Ryan Donato!